On December 14, 1989, as many Alaskans were preparing for the Christmas holidays, Redoubt Volcano explosively erupted, heralding the beginning of a six-month-long eruption. This eruption was the second most costly eruption in U.S. history, and jump-started the newly-created Alaska Volcano Observatory (AVO). December 15 dawned cold and stormy as Redoubt sent a blast of ash skyward that soon rendezvoused with a Boeing 747 jetliner from Amsterdam carrying 244 passengers and crew on approach to Anchorage International Airport. The ash caused all four engines to shut down, sending the plane into a steep gliding descent of more than 10,000 feet. Fortunately, once clear of the ash, the pilots were able to restart several of the engines and safely land the plane, thus averting tragedy. Although AVO had been conceived in April 1988, the observatory was literally born on that memorable December morning as scientists scrambled to monitor and assess the ongoing activity, answer the phones, and respond to the instant worldwide media blitz. In addition to wreaking havoc with domestic and international air traffic, the eruption disrupted Cook Inlet oil storage and production for nearly a year, and caused $160 million in economic turmoil across southcentral Alaska. The eruption also marked the beginning of AVO's systematic monitoring of Alaskaâ€™s 52 historically active volcanoes, and ushered in a newfound public awareness of volcanic activity and hazards. 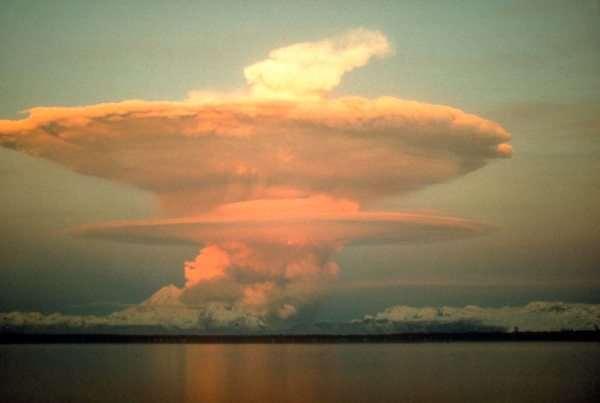 Alaska has remained a volcanically active place: in the 25 years since Redoubt's 1989-1990 eruption, AVO has responded to over 50 eruptions from 20 different volcanoes, including Redoubt's most recent 2009 eruption. Over the same time period, AVO's monitoring footprint and toolkit has expanded considerably, vastly improving our ability to warn of volcanic activity in Alaska. Today, AVOâ€™s ground-based monitoring of Redoubt volcano includes 10 seismic stations to detect earthquakes and other seismic signals, 4 GPS stations to detect motion of the ground, and 3 webcams for visual monitoring. At Redoubt and other Alaska volcanoes, AVO also uses a variety of other data, such as satellite imagery, infrasound, and gas monitoring flights to detect volcanic explosions, gas, ash and thermal emissions. In addition, AVO staff work with the National Weather Service, the Federal Aviation Administration, and other agencies to improve the coordinated government response to eruptions, particularly as they affected commercial aviation across the North Pacific. More information on the 1989-90 eruption of Redoubt Volcano is available here.